As things get busy with Summer coming up, treat yourself to this tasty Strawberry Coffee Cake. I just make it in an old 9 x 13 pan, and it makes a lot! Make one for Mother's Day! 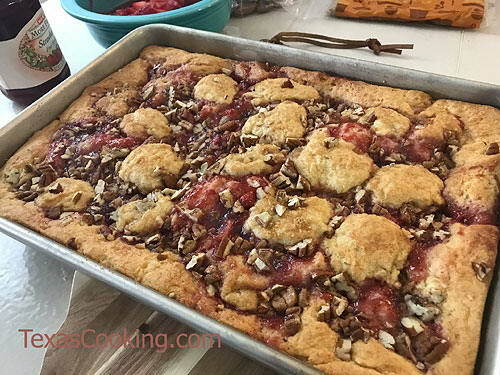 Mixing mashed fresh strawberries with the preserves make this coffee cake taste all strawberry jammy. Makes a large coffee cake that's great for serving lots of guests, or potlucks. Grease and flour a 9x13-inch baking dish. With a pastry blender, mash the strawberries in a mixing bowl, and set aside. With an electric mixer, cream together the cream cheese and butter. Gradually add the sugar, and beat until light and fluffy. Add the milk, eggs and vanilla, mixing well. In a separate bowl, stir together the flour, baking powder, baking soda and salt. Add dry ingredients, a little at a time, to creamed mixture, beating until blended. Batter will be stiff. Spread half of batter evenly in prepared baking dish. Combine preserves and lemon juice with the mashed strawberries. Spread mixture evenly over batter in pan. Dot remaining batter evenly over preserves. Combine the chopped pecans and brown sugar, and sprinkle over top. Bake in preheated oven for 40 minutes, or until cake tester comes out clean when inserted in center of cake. A Sweet Pea Chef: 10-Minute Homemade Enchilada Sauce, M Delish: Make Your Own Taco Seasoning, Cha Ching Queen: How to Make Cauliflower Pizza Crust or Pie Crust, The Weekly Menu: Red Lentil & Wild Rice Soup, Natalie Paramore: Prickly Pear Margaritas, Imperial Sugar: Apricot Upside Down Cake and Cherry Limeade Margarita, Ausinot visits Texas 46 BBQ in the Hill Country, The Smoking Ho visits RED DIRT BBQ & MUSIC FESTIVAL 2018. Texas Monthly BBQ: The Burger at LeRoy and Lewis Is Hard to Top -- another great food truck in Austin. Addie Broyles: What's Your Mom's Food Story? Applesauce muffins, chicken soup and turnip greens? Dallas Observer: A Comedian, Magician and Musician Explain Cruise Ship Gigs Aren't Where Performers Go to Die. Fort Week Weekly visits places to eat in Haltom City's "Little Asia". Houstonia: Please Stop Giving Absolutely Everything a Standing Ovation - One writer argues Houston's profligate clapping renders the standing O meaningless. MySA: Everything You Need to Know about San Antonio's Tricentennial Week ( which is happening now ). NYT: Rachel Ray is looking for her next act . Texas Standard: Who Owns San Antonio Cemetery Where Well-Known Local Names Are Buried? Where in Texas to get the best wildflower photos this spring. Texas Parks & Wildlife: Explore Texas State Parks this Spring. A Piece of Texas: A Travel Documentary - new documentary/music video of a true Texas road trip celebrating the people, places and wide-open spaces that define the Lone Star State.